I was approached by members of Harrowgate Hill Christian Fellowship, UK, to design a logo, branding, stationary, website and welcome pack for them. In short, I was to design a church logo design and coherent identity system that would work well across print and web. I was to design a logo, first and foremost, that would represent a sense of community in regards to the church. The design was to be both welcoming and contemporary—forming a platform where outreach to surrounding communities was key. The rest of this post shows both conceptual work and excerpts from proofs I sent to the client. All text in block-quotes shows how I described the designs to the client. The images roughly show the design process; taken from multiple PDF revisions. If you have any questions about the process shown, please leave a comment at the end of the post. 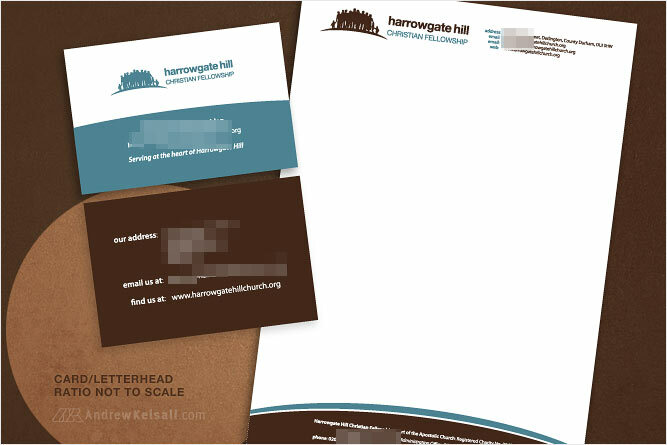 Here are the church logo designs I produced for Harrowgate Hill. Concept A I have designed this logo with a clear, modern, down-to-earth and friendly impression in-mind. The icon represents the Harrowgate Church at both the centre of the surrounding community—which forms a Cross. In another level of thought and perception, I intended the logo mark appear as though it’s a very abstract map of the surrounding housing and streets. […] All the logos show a revised logo icon, with another alternate version on page 6. I have experimented with different font combinations and using a lower-case “h” and an upper-case “H” on the first two pages. Concept B This design builds on the friendly message of community-building. The name “harrowgate hill” is in lower-case letters to promote a sense of modernism and friendly attitude; “Christian Fellowship” is in all-caps to balance the typography and show solid authority and leadership. After looking into the whole “window on the community idea”, I designed a logo icon that is based on the windows you have installed in the HarrowGate building (I researched on Google Streetmaps and looked at the building from different angles). As can be seen, the windows also show a Cross. […] I have taken out the figure with the flat cap and reworked the figure to suggest a youth or younger person resting his head on a man’s shoulder. Without a flat cap, it is more difficult to define someone who is older, however, I have made subtle changes to the rest of the figures to give the impression that a group of people, from children to woman & men of varied ages are stood closely together. I have reviewed the images you sent with the suggestions and have included a woman holding a child as well. 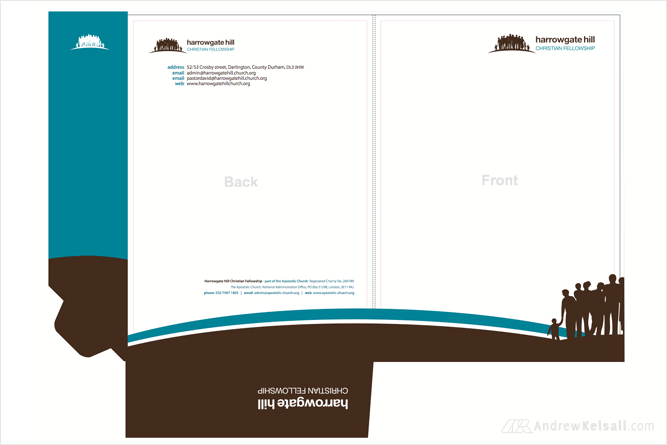 Above: I designed a welcome pack folder to hold a letterhead and business card design. 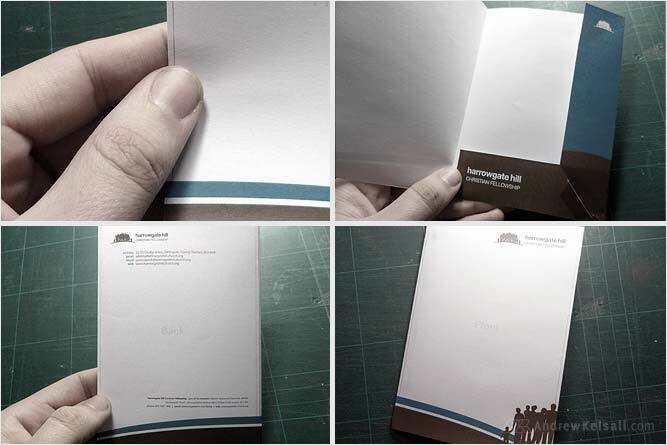 Here, I have printed out a small-scale version of the folder to cut out and create a mockup. I would strongly advise that this process is carried out if you ever design one. Above: This is how the folder design file looked after completion (Harrowgate Church used their own printers for this, so I don’t yet have a printed example to show). Above: This is the letterhead and business card design. Details have been masked for client privacy reasons. 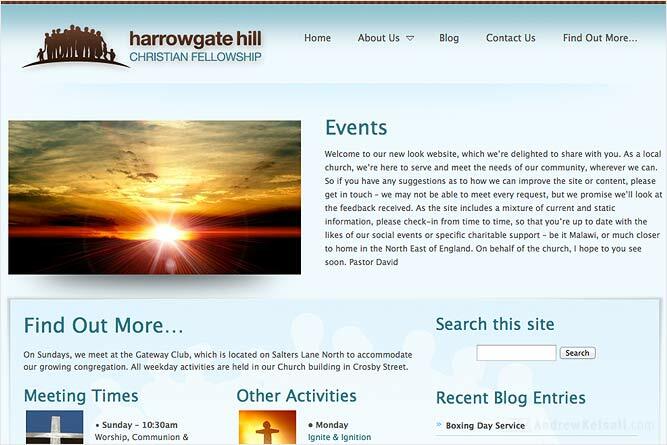 Above: The website design, located at HarrowgateHillChurch.org is based on the WordPress CMS. I purchased a base-theme to build the site upon, which was the preferred option based upon the client’s budget. Above: This is the final logo design. Credits: Brown Background CC Source: Bittbox on Flickr. This was a great project to work on—and here;s a thanks to all the great people over at Harrowgate Hill Church. If you would like a free logo design quote, please complete my Church Logo Design form over on my-sister site, Pure Christian Graphic Design. I love the logo and how you incorporated it into the church’s stationary items! Very creative. Thanks for sharing this. I’m assuming the client chose the option that is finally presented. Are there concerns for printing in small areas (pens) or flexography style because of fill in? I think the strongest concept presented was “C”. I would have loved to see that one developed. Really good work though, I’ll be sure to keep checking out your site for more great work. Thanks again! Nice to read your exceprts and see a rough concept development – great work! Nice collection you got. Love the design and style of each one. Thanks for sharing . JpDidit → Yes, the main logo shown is the chosen one, and the stationary shown. I liked “C” too, although the church didnt want an association with surrounding buildings, but people. Thanks for your thoughts on the logo. Great work – and a great post. I can see why they went for the option they did – it speaks so much of community / fellowship to me. I like elements of all the concepts you presented – but I think I would have made the same choice as Harrogate Hill did. I really like the way you have cropped the group on the side of the welcome pack. Simple yet a great effect. These are fantastic logos Andrew! I have to say that my favourite would be the additional concept C — but I agree with Andy — it’s clearly understandable why they went with the people’s logo. Andy → The sample pack went through more design changes and mockups than I showed in this post, and yes, the final design was quite simple and effective – thanks for noticing! Ray → At the end of the day it’s the clients logo, and I understood their choices and direction for this.